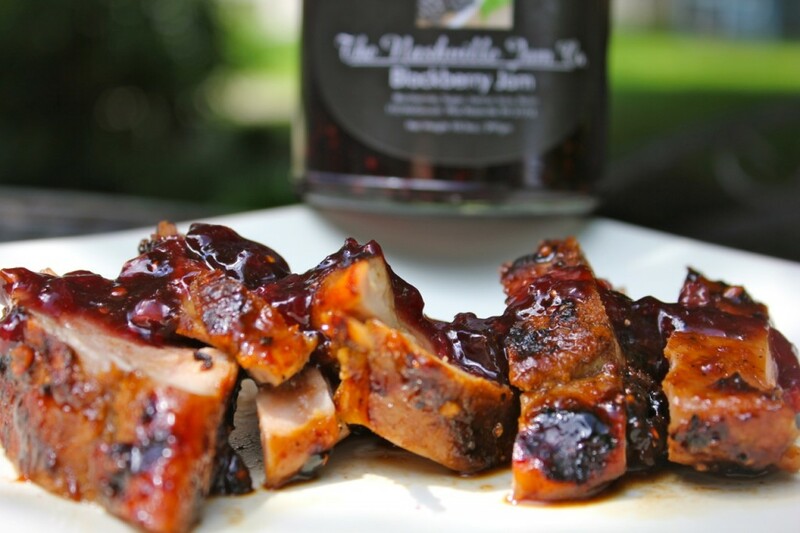 I am so excited about this yummy recipe, because I got to use The Nashville Jam Company’s delicious Blackberry Jam in it! This jam is made by a couple that live in Nashville of course, and let me tell you it is really fantastic! The rich Blackberry flavor really compliments the savory pork in this dish. It is definitely a grilled main dish that will be perfect for entertaining this summer. Be sure to check out my Facebook page, Cooking With April McKinney for an awesome giveaway of some of these Nashville Jams! In a small sauce pan over medium heat, add oil, then add shallots and garlic. Cook while stirring for about 1 minute. Stir in the jam, lime juice, zest, mustard, vinegar, salt, and pepper. Preheat Grill to medium high, once grill is hot add pork, and cook for 15-20 minutes, rotating every 5-6 minutes. Once pork is almost cooked through, begin brushing on glaze on each side of pork. Once glaze has slightly caramelized, remove from the grill. Allow pork to rest for 5 minutes, covered with aluminum foil, then slice and serve with remaining glaze. What to look for in remedies online? Remedies like Deltasone usually is used to solve conditions such as breathing problems. Prednisone is a white to almost white powder. Kamagra is for the treatment of inability to get or keep an erection and similar states connected to erectile dysfunction. If you’re concerned about sexual problem, you have to talk to your physician about http://journal-info.net/buy/generic-levitra.html and buy generic levitra. What is the most vital information you have to consider about kamagra? (Read more buy vardenafil). Betweentimes men need medications to resolve sexual health problem. Having erectile malfunction can certainly complicate dating. Some medicines may interact with this medicine, including over-the-counter herbal products. Not all probable interactions are listed in standard medication guide. Don’t forget, the best way to avoid forged medications is to get prescription drugs like Kamagra from a reliable online service with which you are familiar.